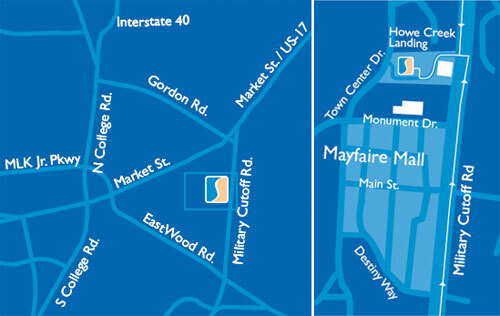 Below are directions to our office from various locations. If you need help navigating, please call us at 910-256-2100. Follow US-17 South towards Wilmington. Exit right onto US-17 S Business/Wilmington. Go 3.7 miles and turn left at Military Cutoff Rd (sign says “76 Wrightsville Beach”). Go 1.2 miles and turn right into Howe Creek Landing. Follow I-40 East towards Wilmington. Exit right at exit #420 (117N/132N). Turn right onto Gordon Rd. Drive 2.5 miles until Gordon Rd ends at Military Cutoff Road. Turn right and drive 0.9 miles. Turn right into Howe Creek Landing. Follow US-17 North towards Wilmington. Merge right and follow signs onto US-17 N/ US-74 E/US-76 E and drive 2. 6miles. Merge right and follow signs onto US-17 N/74 E/ US-421 N/ NC-133 N. Drive 1.7 miles. You will pass the Battleship Memorial and go over a bridge. Turn right at sign for Wrightsville Beach US-74 E/NC-133 N.
Go over bridge and merge right onto Martin Luther King Jr Pkwy US-74 E/ NC-133 N via the ramp to Wrightsville Beach/ Burgaw/ Airport. Continue to follow Martin Luther King Jr Pkwy/US-74 E for 5.1 miles. Turn left at Market St and drive 2.0 miles. Turn right at Gordon Rd. Turn right at Military Cutoff Rd. Drive 0.9 miles and turn right into Howe Creek Landing. Follow US-74 East for approximately 73.0 miles to Wilmington area. Follow directions for South starting at #2. Turn left at Dr Martin Luther King Jr Expy/NC-581 S/US-117-BYP S/US-13 S.
Continue to follow US-117 South to I-40 connector. Exit onto I-40 East and follow directions from East. Follow I-95 North 18.6 miles. Take exit 73 toward US-421/NC-55 and merge onto Access Rd. Continue on NC-55 East for 13.6 miles. Turn right to merge onto I-40 East. Follow directions from East.